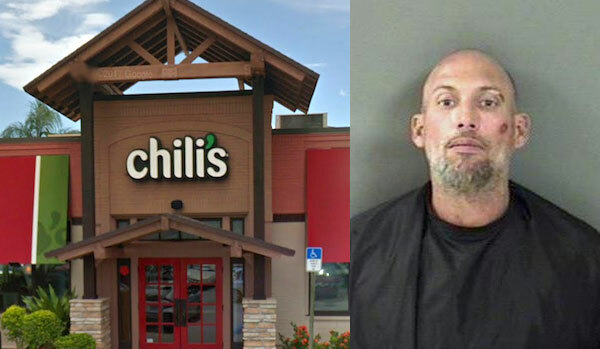 Man punches cars and challenges people to a fight at Chili's in Vero Beach. VERO BEACH – A man was seen yelling at people and challenging them to a fight Saturday night at Chili’s Grill & Bar in Vero Beach, police say. Joe Henry Babcock, 43, appeared to be intoxicated as deputies arrived from the Indian River County Sheriff’s Office. He was seen running up to people and “trying to fight with them,” according to the report. Two witnesses said Babcock began yelling at people at Chili’s and challenging them to a fight in the parking lot. One witness said he ran up to several vehicles and struck them multiple times with his fists. Each vehicle he approached sped away. “He balled his fists, bladed his body and positioned his feet in a manner consistent with someone who was going to throw a punch,” the deputy said. Babcock became increasingly aggressive while yelling obscenities in front of the Vero Beach restaurant. He had difficulties maintaining his balance and had a slurred speech. The subject then advanced towards another deputy with his hands curled into fists. The deputy ordered Babcock away and to not touch him, the report said. Deputies then tried to detain Babcock for questioning, but he resisted. There was a scuffle between him and the deputies. Babcock was arrested and charged with Disorderly Intoxication, and Resisting Arrest. He has since been released from the county jail after posting $1,000 bond.